This story is the third part in a four-part series about our Halfsy Hero, Andi Hallgren. Our series will follow Andi and three other heroes as they train for the November 6th Good Life Halfsy. Andi is secretly hoping for snow on race day. Not a blizzard, just a light dusting, a brisk chill and the excitement that comes from the first snow. With each passing day, Andi said she’s getting more excited for the race. She’s feeling stronger with each run, faster with each training session and more and more ready to help others cross that finish line. As a race pacer, Andi’s perspective about the race shifts as she gets closer to race day. She’s not running this race to mark it off her bucket list or meet a health goal, Andi is running it to help others cross the finish line. Sure, she’s accomplished some of her own goals during training, but now is the time when Andi is mentally thinking through the race and how to help the runners around her run their best race. As a seasoned runner, Andi knows that a half marathon typically gets difficult for runners at the 5-mile, 8-mile and 10-mile markers. These are points when runners get tired, frustrated or even start to walk, but Andi is prepping her words of encouragement for moments like these. Some of Andi’s favorite running mantras are, “Run the mile you are in,” and, “When your legs get tired, run with your heart.” She’ll be sharing these quotes with runners on race day – encouraging them to the finish line. Andi said that every mile is a celebration to her. It’s one step closer to the finish line and meeting a goal – helping people get there is what excites her most. It’s why she carries an old school stopwatch, her phone and wears her Garmin on race day – she likes to be ultra-prepared to keep the runners around her on track. From start to finish on race day, Andi is all about helping others. From her pre-race pep talk to her words of encouragement during the race and the celebration post-race, each moment is equally important. 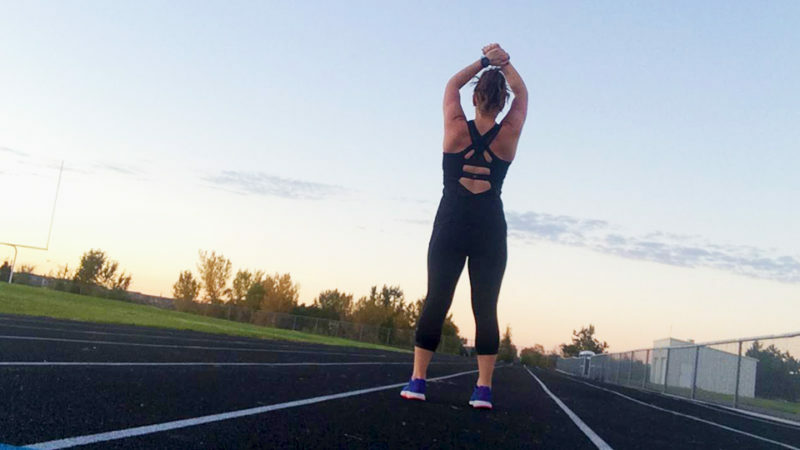 Andi runs as a way to stay fit and help others, but she also runs, simply, because she can. Her grandmother developed Multiple Sclerosis in her 40s. She fought the disease well into the last years of her life and Andi’s memory of her grandma is of a strong, courageous woman. When her grandmother passed away, Andi’s mother commented that she knew her grandmother took off running when she got to heaven. On days when it’s difficult to make it through a run, Andi said she thinks about people who physically can’t run, like her grandmother. It helps her push through, stay positive and finish well. On race day, she’ll be thinking about her grandmother and running in her memory, like she does for every race. She knows her grandma would be proud of the way she’s helping others, and that’s what propels Andi forward in the race and in life. Check back for more Halfsy Hero stories and to read the final installment of Andi’s story.